The ArcMap application within ArcGIS allows you to create an amazing variety of fonts, colors, and types of labels that identify point, line, and area features. One of the most useful types of labels is the callout label. This label “calls out” from the label to an off-site location that is typically not on the feature itself, and sometimes helps make maps that are more clearly understood by students. Consider the following example for a lesson I created about the Philippines. 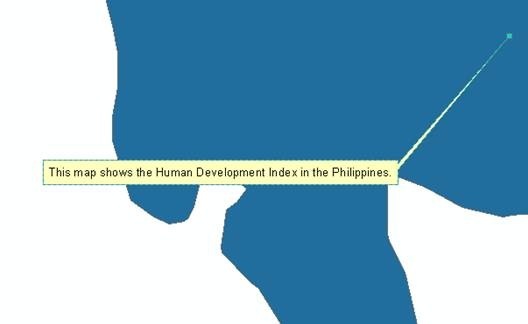 Here, if the labels were placed on the islands, they would obscure the data I wanted the students to explore, which was the human development index by administrative area (province). Therefore, I used callout labels so that they would be offset in the ocean. How did I create these labels? Under the Layer Properties, under Labels, I selected a “Banner” style label. Under Properties for the banner style, I selected Properties once again, and then bumped up the x offset to 45 and the y offset to 30. 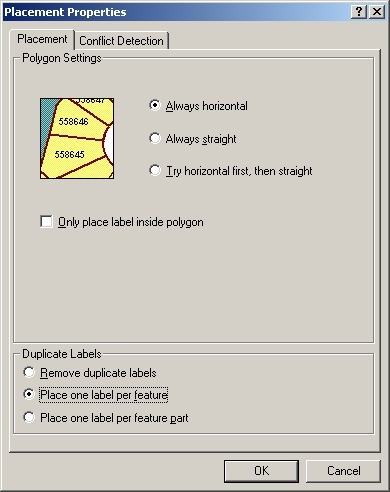 You will have to experiment with your own data set for the optimal offset, depending on your map units and the feature shapes that you wish to label. I set the colors for the background and for the text. After remembering sticking sticky-back callout labels on maps way back in cartography’s manual days with an Xacto knife, these ArcGIS tools show the progress that has been made over the past 25 years! I invite you to explore label placement to help the maps do what they are designed to do—to communicate!